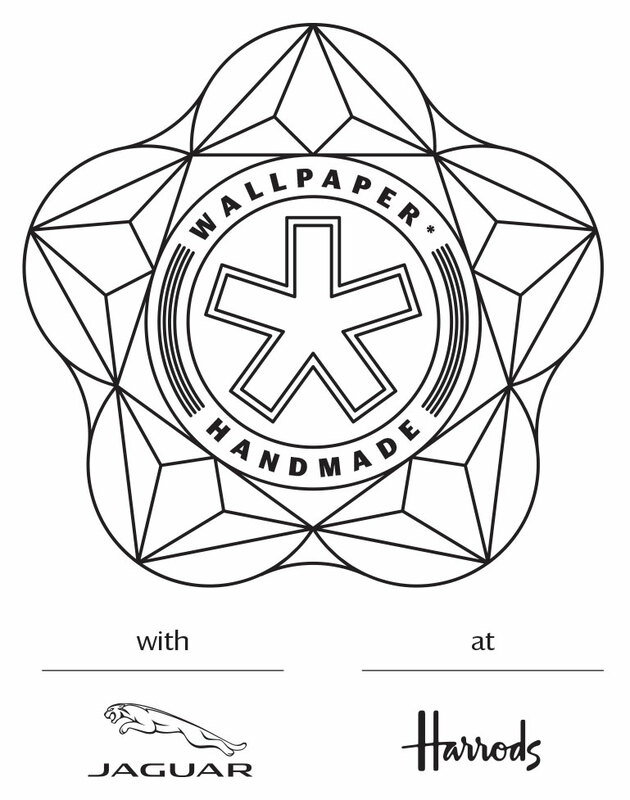 Wallpaper* Handmade is the magazine’s groundbreaking exhibition dedicated to the marriage of craftsmanship and design. Each year, Wallpaper* commissions select designers, makers and manufacturers to create one-off items of furniture, fittings, fashions, food and more. The exhibition, in its fourth year, traditionally takes place in Milan during Salone del Mobile. Now, Wallpaper* has teamed up with Harrods and Jaguar to present a curated selection of the best ever Handmade pieces across 12 windows of the iconic London store. Plus, the show also introduces five all-new collaborations between Jaguar and established designers, craftsmen and brands from around the world. Here, we give you the story of each piece, window by window. We asked fashion designer Neil Barrett to turn his talents to furnishing fabrics, challenging him to create his version of the ‘Jensen’ armchair and ottoman, designed by Rodolfo Dordoni for Minotti. Working with a traditional mill in Como, Barrett magnified, then unravelled, a traditional chevron pattern, in an engineered double-faced jacquard, in classic chalk and black. Milan-based designer Neil Barrett studied at London’s Central Saint Martins and the Royal College of Art, before working at Gucci and Prada. In 1999, he set up his own menswear label, which has since expanded to include accessories and womenswear. In 2008, Barrett opened his first standalone store in Tokyo, designed by Zaha Hadid and Patrik Schumacher. Italian furniture maker Minotti, founded in the 1950s as a small workshop, has been turned into a global concern by brothers Renato and Roberto Minotti, the second generation of this family business that now boasts distribution in 61 countries. The ‘Jensen’ armchair and ottoman was designed by Minotti’s artistic director Rodolfo Dordoni. Its rigid form, constructed in polyurethane, is cushioned with goose down and finished with a die-cast aluminium base. Paul Cocksedge turns the conventional bookmark on its head. Made of Pentelikon marble provided by Smili, the piece is strong and smooth, created with CNC water-jet cutting technology at the Smili workshop in Athens. Perfectly sized for your Wallpaper* magazine, it comes in two versions that rock. London designer Paul Cocksedge set up his studio with Joana Pinho in 2004. The Studio has created work for the likes of Established & Sons and Flos, while the team continues to explore materials and techniques, pushing the boundaries of technology to produce witty designs and interdisciplinary work. Two established family-owned Greek marble companies merged in 2005 to form Smili, a company that produces high-quality bespoke marble work, using over 850 types of marble from both Greece and abroad. Combining local craft and 75 years’ worth of experience with modern technology, Smili is our go-to marble expert. We asked Studio Glithero to make one of their beautiful films about the beautiful paper planes they designed for us as they were being made by the printers of our exhibition invitations, Baddeley Brothers. A pure line, a movement, a breath, a comma. The light slides over this elegant form thanks to hidden LEDs, which are reflected in marble, alabaster, onyx or brass. A different light provided by the chosen material is created for each piece. Here you have one in Marmara marble and one in cedar wood, made with the help of Turkish artisans. Legendary French lighting designer Thierry Dreyfus is a long-time Wallpaper* collaborator, including recently channelling his conception vision into ten dazzling covers for our November W*152 issue. He has produced some of fashion’s most memorable catwalk shows of the past decade for the likes of Dior Homme, Helmut Lang and Jil Sander, and he also once transformed Notre Dame for Paris’ Nuit Blanche 2010. To create a modern-day set of tools for life’s little jobs, we recruited the talents of the London-based practice, Chauhan Studio, who promptly honed in on combining the contemporary technology and purpose of Fiskars, with an elevated, heirloom-like quality. This resulted in a collection of six implements, featuring a dual-headed screwdriver, hammer, measuring tape, pliers, pencil-holder/spirit level, and hand drill, complete with elm wood accents. Fiskars’ signature orange branding has been reinterpreted as a clever detail on each piece. Together with the accompanying leather tool roll, the collection satisfies both our practical and aesthetic needs. Industrial designer Tej Chauhan made a name for himself early on as a technology specialist. Before setting up his eponymous practice in 2005, Chauhan put in several years at Nokia, creating some of the company’s most memorable models. These days, his signature aesthetic has touched everything from kitchen tools and eyewear to televisions and door handles, making for one of the most wide-ranging oeuvres around. With roots going back to around 1649, Fiskars is one of the oldest businesses in the western world. Originally founded as an ironworks making metal implements, the Finnish company only began making its signature plastic-handled scissors in 1967. Today, the recognisable brand counts other Finnish stalwarts like Iittala and Gerber under its roof. When we approached our new favourite audio brand Aëdle to design a quality pair of cans we could take travelling with us, it enthusiastically took on the challenge. Working in collaboration with Paris’ oldest leather atelier, Bettenfeld Rosenblum, and graphic studio FLOZ, the team’s efforts have resulted in a sleek pair of headphones, neatly packaged in a compact origami-inspired case that features a handy pocket to store the wires. The team used hand-sewn lambskin leather, while the earpieces feature crisply machined metal enclosures. Raphaël Lebas de Lacour and Baptiste Sancho set up this Parisian firm in 2010 after delving into the audiophile world while studying at Tokyo’s Keio University. With no compromise between sound quality and design, all products are hand-assembled in Brittany with a high quality ethos and a ‘Made in France’ attitude. Founded in 1895 by Jean Bettenfeld, Bettenfeld-Rosenblum is the oldest art leather atelier still in activity in Paris. Relaunched in 2010 by David Rosenblum, the firm now works on special projects for major fashion brands and luxury houses. Founded in 2010 by trio Kathia Saul, Rémi Andron and Thiébaud Chotin, FLOZ is a Paris-based graphic design studio that focuses on art direction and visual identity. Past clients include Swatch and hip urban culture magazine, WAD. In collaboration with designers OeO and producer Stellar Works, a collective of Kyoto craftsmen has created a bespoke version of French furniture maker Laval’s writing desk with inlay fabric produced using a 1,200-year-old Japanese weaving technique. On top is a tray for writing tools in 2,000-year-old lignified Japanese cedar, two precious boxes, a writing mat in refined bamboo, an iPad sleeve in bamboo and leather, a small encrier in black porcelain, a notebook with Harlequin fabric, and an ink pen, magnifying glass and letter opener in decorative brass. At When Objects Work, Beatrice De Lafontaine produces some of the best tabletop items around, so we thought it would be fun to ask her to produce something for under the table instead. And since she generally works with architects, we decided to match her with Paris-based Hervé Van der Straeten, known for his design objects with a decorative-arts bent. To make things more fun, we asked the pair to get the product out for less than €200, in Belgium. They produced a waste paper bin in spring-coated steel sheet and lacquered steel wire. Inspired by the creative potential of bringing together age-old traditional handmade techniques with cutting-edge processes, Dentsu London has created a unique pair of Wallpaper* scissors. One side has been handmade by Ernest Wright and Son, one of the oldest and last specialist scissor manufacturer in the UK, while the other has been designed by Jamie McLellan and 3D-printed in black resin. Together, they work in perfect harmony to create a distinctly modern pair with a unique provenance. We asked graphic designers APFEL to team up with manufacturer Emform to sharpen up our desk essentials. Each design is inspired by the object’s function, so the hole punch features cut circles, the pencil holder a scribble pattern inside, and the tape dispenser cut tape shapes, while its roll of tape bears the phrase ‘Daydreams on desktops and other rituals of everyday life’.